The famous Marine photograph, ‘Iwo Jima’, was taken by AP photographer Joe Rosenthal in 1945. The events in the photo took place on Iwo Jima, a volcanic island due south of Tokyo. The U.S. invaded Iwo Jima on Feb. 19, 1945 in World War II, and the battle of Iwo Jima is considered one of the bloodiest in Marine Corps history. The flag raising in the photograph took place on Feb. 23, 1945, five days after the battle began. The purpose of the raising the flag was to signal to U.S. troops that Mt. Suribachi had been secured. Two groups of men were used to raise the flag. 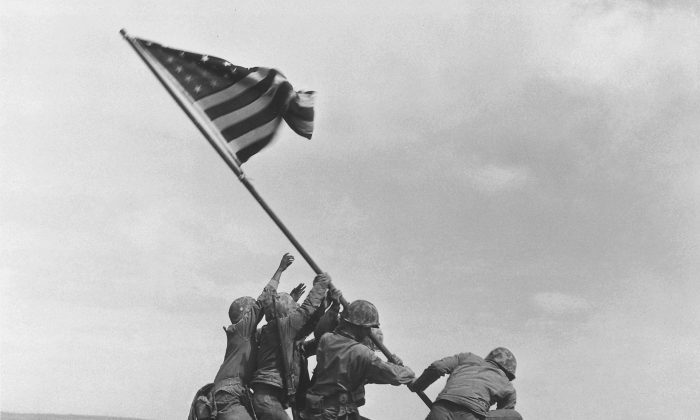 The flag raised by the first group was too small, leading to a request for a second group of men, who were captured in the iconic photograph. The photograph become popular very quickly, appearing on newspapers across the United States after it was published, as well as on postage stamps and War Bond posters. The six flag-raisers were originally identified as Cpl. Harlon Block, Navy Pharmacist’s Mate John Bradley, Cpl. Rene Gagnon, PFC Franklin Sousley, Sgt. Michael Strank, and Cpl. Ira Hayes. However, a few months ago the Marine Corps stated that researchers working on a Smithsonian Channel documentary on the photo approached the marines and suggested that one of the men in the photo may have been misidentified. The panel has since come to a conclusion. The Marine Corps say that they now believe that rather than Navy Pharmacist’s Mate 2nd Class John Bradley, it was Private First Class Harold Schultz from Detroit, Michigan, in Rosenthal’s image. Bradley had been involved in the initial flag raising instead. “Our history is important to us, and we have a responsibility to ensure it’s right,” Neller said.